Built-in CPD. Our new model. This is the cover of our newly published CPD booklet that sets out our master plan for next year. ‘Continuing’ has somehow morphed into ‘Continual’ which I rather like! I’m thrilled that, after some consultation with parents, governors have approved our new built-in CPD approach. This follows the model used at John Tomsett’s Huntington School in York where, every fortnight, school finishes an hour early and staff have a two-hour CPD session. On that day, all the lessons are 10 minutes shorter, registration and lunch are 5 minutes shorter, so we create an hour spare whilst giving students their normal structure. Combined with the weekly meeting time, we have two golden hours every two weeks to get stuck into some proper professional learning. It’s going to make such a big difference. This model promises to deliver on several of the findings outlined in the superb report from the Teacher Development Trust Developing Great Teaching. Based on research conducted by TDT, CUREE, the IoE and Durham University, it sets out the key features of effective and ineffective CPD. The need for a rhythm and proper time for CPD is a key finding; time for reflection, to build alignment with teachers’ values and attitudes and to evaluate against student outcomes. If you’re going to do CPD, you might as well do it properly – so that’s what we’re trying to do. In our model, we’ve carved out 18 of these fortnightly sessions. 12 of them belong to departments. These will be the engine room of school improvement. We recognise that subject-specific pedagogical learning is the most important element of CPD. Each session will include reflection on the previous learning, new input and action planning. Departments have scope to plan these sessions to suit their individual and collective development needs. I suspect that a common feature in the next year will be assessment: moderating and designing assessments to align with all the recent curriculum developments. There will also be scope to explore specific content areas to share and develop subject knowledge. 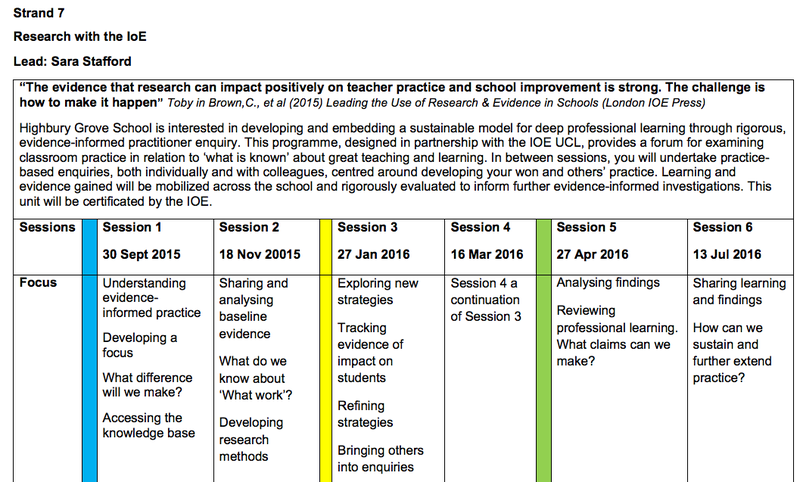 Designing effective two-hour CPD sessions is something we’ll be working on throughout the year. Unlike meetings (which still happen in the alternate weeks), the CPD sessions will focus on professional learning and we’ll be explicit about the need to generate alignment – a process that is missing all too often. 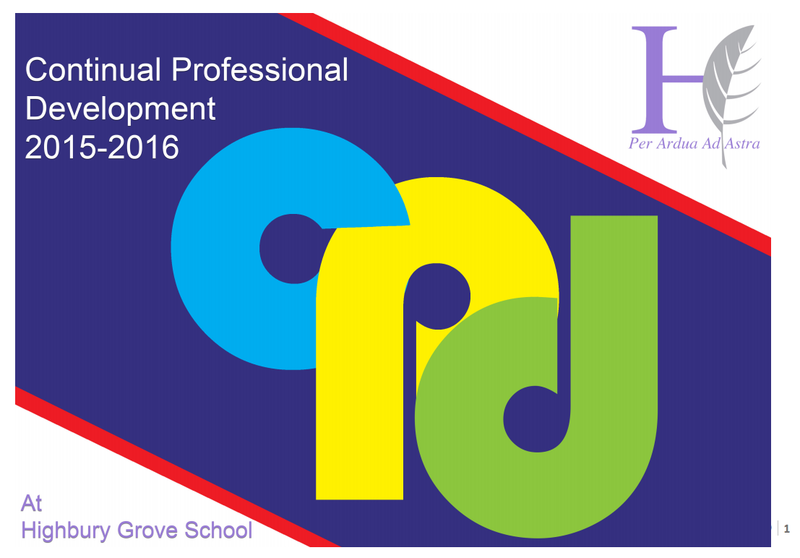 The other 6 half-termly sessions are designed to provide some other strands of CPD that run across departments. Teachers and support staff have to choose one strand to follow for the year. The 18 sessions are in addition to our five INSET days that each have a specific purpose. In May, one INSET day will include our annual Festival of Learning with a TeachMeet section and market place section. Everyone has to share their learning from the year so far. Strand 1 will feed into the development of a whole-school feedback policy. Strand 2 is an opportunity to develop behaviour management skills. 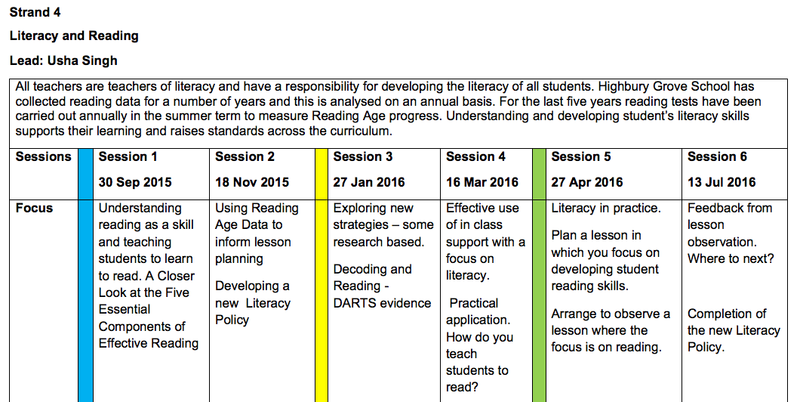 Strand 4 will provide a forum for us to develop our policy on literacy including reading. Strand 5 gives an opportunity to develop ideas about e-learning, very much at an early stage at HGS. 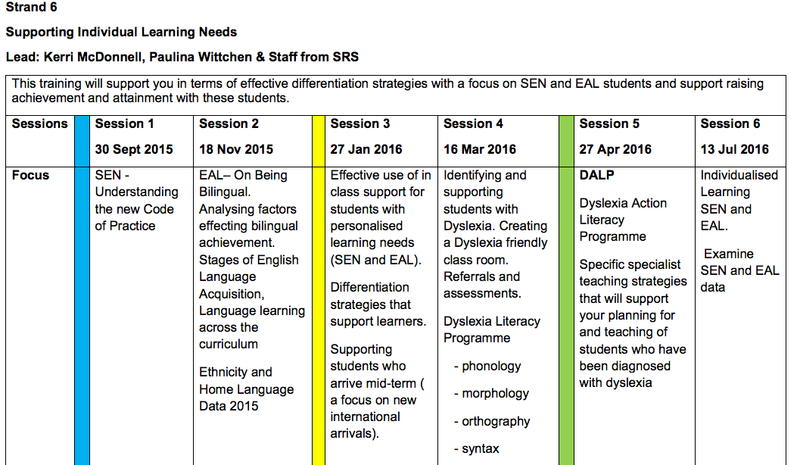 Strand 6 is an opportunity to learn more about aspects of SEN provision. Strand 7 is delivered in partnership with the IoE giving participants the opportunity to undertake action research projects within the school. In addition to this, we have a number of CPD opportunities for support staff. They each have specific job roles, often with professional qualifications routes to follow, and that is all included. Crucially, we need to evaluate all of this and that will be a challenge. Part of the work this year will be to devise effective evaluation tools. When we hosted the NTEN Annual Conference earlier this month, Professor Rob Coe asked this challenging question: “How will your students’ learning be different if your learning has been successful?” That’s going to drive our thinking. Ultimately, it all needs to feed into student outcomes and we need to find ways to measure and evaluate that process. Many thanks to Adrienne Bottomley, Sara Stafford and Vicky Dale for their work on this, alongside the workshop leaders indicated. « PSHE Matters. Our specialist delivery model. Thanks! It’s got to make a difference compared to relying on INSET days alone. This looks great, thanks for sharing. I think it is becoming increasingly clear that responsibility for the provision of high-quality CPD, and thus the development of teacher professionalism, rests with headteachers as the (representative) ’employer’. It’s great to see such a significant commitment to supporting your people, so great credit must go to you and your governing body for your enlightened approach. It’s particularly inspiring to see such a large proportion of time dedicated to subject-specific CPD, as this is so often the hardest thing to find time and resources for. A couple of questions – the TDT review of evidence highlighted the importance of external providers, both as a source of expertise which may not exist in-house and to provide mentoring/coaching which is separate from the school’s hierarchy. You mention a partnership with IoE to deliver the generic training on research; are any of your departments working with other schools, or with subject associations, to support the subject-specific aspect of your programme?Secondly – and I appreciate you won’t want to get into the detail of this – but how are your paying for this programme? I ask because school budgets are so tight and headteachers often tell us that can’t resource CPD to the level they might want to. Do subject departments have a devolved budget to buy in external providers? Or is it all, or mostly, done in-house? It would be great to hear your thoughts on this, or discuss further in another setting. Hi David. Thanks for the comments. We’ll be using external people where we need to – some Local Authority English advisors are well-regarded; we’ve done some work with specialist input on Physics teaching, for example. It will depend on what people are doing. I think we’ve got some good expertise in-house in other areas – but I”m keen to avoid the scenario where the CPD is not driven by true expertise. The programme structure is actually very low-cost as most of it is delivered in-house. The overall budget for CPD is all lined up as one of the ways we spend our Pupil Premium money (we’re 70% FSM) and we’re trying to protect the amount we spend. However, it is all kept centrally so we can prioritise. Heads of Dept will make costed requests which we can evaluate against other demands. It’s still common for people to want to go on training led by exam boards for obvious reasons. I”m going to be setting a higher bar for people going out on one-off CPD courses; they’ll need to fit into a longer-term process or feed into our fortnightly CPD sessions. This is really interesting, thanks for posting. I am curious to know what you do at the school regarding CPD around progression to HE? I work in university access and it seems there is a lack of structured and recurrent CPD in this area – however I’m keenly aware that I may just be ignorant of work schools are already doing so it would be really interesting to know if there is anything good already out there to equip teachers to provide good, up to date advice about HE for their students. Brilliantly answers the question of how to find the time to develop staff without adding fixed hours onto the teachers’ school week. Carol here (ASCL Leadership Specialist, formerly Hornsey HT). Thank you for sharing, Tom. Great example of well designed CPDL Curriculum that uses the recent TDT and H.E /CUREE group findings. I’m currently drawing up ASCL guidance for effective CPDL (we have policy ..see website) and wonder if we might reference your model as well as others (you’ll be credited, of course). Key question, using research findings made explicit in TDT booklet, is if we start with the principle that this is to improve outcomes for students and therefore student needs are audited (targets?) then how do we ensure that that staff needs are met to outcomes (differentiated) as they can be so different. Happy to visit, talk further once term starts. Hi Tom,this looks great, very well thought through. 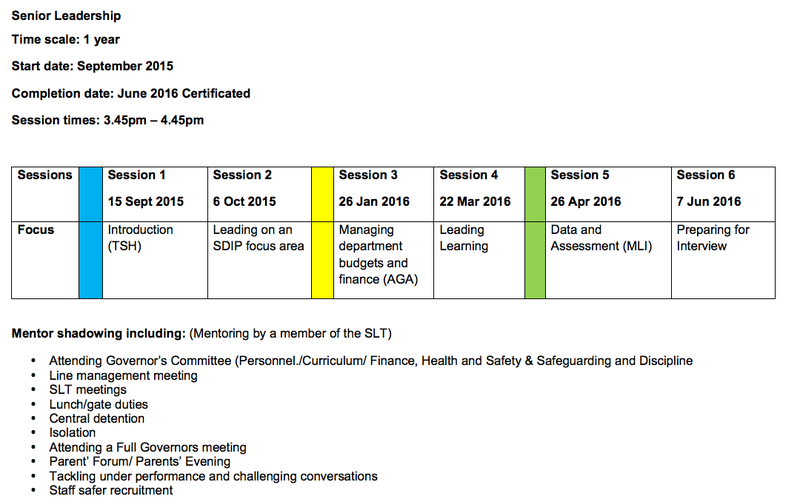 I’m particularly interested as I am lead for CPD and teaching and learning from September at my school. I think that your school has been brave and done the right thing in following the TDT “rhythm” by embedding it regularly and taking back an hour from teaching time. Was this difficult to do? Can you offer any advice on how your school achieved this please? Really interested to see you include “spoken literacy” in Strand 3. Have you seen 21 Trust’s work on this? http://voice21.org/ has a wealth of curriculum, training & assessment content that might be interesting for your team when they’re putting this course together. Thanks also for sharing the wider framework, of course! This looks great. I really like the idea of it being a two-hour block that is carved out of the school day. I think this shows a real commitment and recognition of the importance of CPD. I am particularly interested in the E-Learning and Research Based Learning Strands. Having worked as a study-skills workshop designer and presenter, I was shocked to discover that when I did my PGCE, there was barely any mention at all about how and why the brain learns (or not) or the psychology of learning. I hope that these CPD strands can be used to start to address this. amazing blog – very inspirational – by the way. Thanks Jason. We are doing a survey of all staff at the moment – one to identify areas to improve our CPD strands and one through the Teacher Development Trust Network audit process which has a wider scope. I don’t think it’s possible to link directly to outcomes too directly although over time I’d hope our outcomes increase. Even if they do, we would struggle to demonstrate this links directly to the CPD. However we can trace improvements and the spread of some ideas we’ve delivered through the CPD programme during observations and departmental review. Thanks for getting back to me. I agree that it probably isn’t possible to make a direct link. I just find it hard to make this case sometimes to others who believe that all interventions/developments need to be linked to student outcomes and measured precisely. It seems to be quite a radical suggestion for some teachers and senior leaders. thanks again, Jason. Hi Tom. I have looked at this page 100s of times. Do you have a template you could share please? Thanks Ross.